The commercial prospects for jazz had been on the decline since rock replaced it in the late 1940’s as black America’s primary musical outlet and by the dawn of the 1960’s jazz was largely viewed as either eccentric music for self-styled hipsters and beatniks or old people’s music to put you to sleep by. This of course was hardly fair or accurate, but then music criticism designed to… well… criticize rarely is. But in the 1970’s some more ambitious minded rock musicians, apparently tiring of the simplicity of many more basic forms of the music and wanting to prove their chops in a classier style (or perhaps disillusioned with actually appealing to a wide swath of the public with rock ‘n’ roll), began to immerse themselves in a style that was dubbed jazz-fusion. On the surface it was an ambitious idea that offered potential upside all around. To see highly skilled and widely respected rock-based guitarists such as Jeff Beck and Pat Matheny, and groups such as The Mahavishnu Orchestra and Weather Report, actively trying to bridge the divide there may have been some who hoped rock’s cachet might swing some listeners back into this modernly neglected field, opening the doors for a commercial re-awakening with the ex-rockers as merely the convenient entry point. But that turned out not to be the case, especially since true jazz aficionados looked down on the very idea of pandering to a more mainstream style with such gimmicks, while rock audiences tended to find the music too pretentious for their simpler tastes and largely ignored it. Consequently, both at the time and in the years since, it was considered by many fans and critics of both rock and jazz to be a failed experiment in a lot of ways. Surprisingly though at the same time this was going on some legendary jazz musicians were crossing the street in the OTHER direction, as the likes of Miles Davis and Herbie Hancock made very definite moves towards rock ‘n’ roll. Because of their overall stature they were harder to criticize for their attempts at these stylistic hybrids, though most jazz purists still stuck to their more traditional work and hoped these efforts were but a short-lived phase soon forgotten. 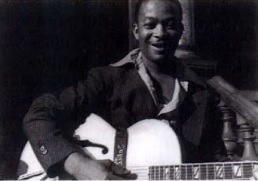 But while the overall movement designed to bring the two distinct approaches together wasn’t a success – at least on a wide scale basis – there were some cases, such as guitarist George Benson’s take on rock star Bobby Womack’s Breezin, where the results of these rock meets jazz forays proved to be both aesthetically and commercially rewarding, pleasing everybody on opposite sides of the spectrum. However that was merely a notable exception to the general rule that had existed for decades which kept these two musical forms far apart. Of course the ironic part of all this is that jazz is where rock itself originally stemmed from, albeit a more populist form of jazz that was primarily dance music in the 1940’s as slimmed down big bands (themselves seen in their heyday as somewhat of a bastardization of jazz for mainstream consumption) were re-worked in the post-war years to emphasize a less high-brow style of the music not tied to the society set. For the most part the break was rather clean though, which meant they were quickly divided and shuttled off to their own camps rather than rock being seen as an off-spring or subgenre. The two styles largely kept their distance as those who came of age IN jazz stuck resolutely to it, even as its ability to reach audiences in the singles market were fading fast as the 1940’s drew to a close and rock offered a commercial respite that in other instances would’ve been enticing enough to attempt to pull it into jazz’s sphere as a means of economic survival. But the lines had been drawn and so the more ambitious jazz musicians would embrace bop along with some cool jazz while dreams of leading a big bands retained an allure for artists who came of age when such an aggregation was seen as the pinnacle of achievement. As a result this newfangled rock ‘n’ roll with its cheap musical exploitation and increasing commercialism designed to appeal to uncouth ruffians and assorted riff-raff was considered by most jazz reared musicians to be beneath them. Now we HAVE seen a few jazz musicians with highly regarded pedigrees make the move to rock ‘n’ roll and reach some notable heights in the process. Tiny Grimes went from playing tenor guitar with Charlie Parker to leading a rock band that still maintained jazz instincts at times while Joe Morris left Lionel Hampton with tenor saxophonist Johnny Griffin in tow and cut rock records for a decade with success, even after Griffin returned to jazz himself, unable or unwilling to tolerate the compromise any longer. But in the big scheme of things they were still few and far between and most who tentatively made the move in these early days fell on their face and quickly moved right back to where they were more comfortable. The latest in that brigade of jazz expatriates who tried their hand in rock was Edgar Hayes, somebody with a long background in the older, more established and respected jazz field who found himself at a career crossroads just as rock was becoming a more viable option for maintaining relevancy. Unlike most of his brethren who tried making the jump from one to the other and quickly thought better of it, Hayes pulled off the feat with surprising ease and apparently without many reservations about doing so. First a little background on Edgar Hayes, who certainly must seem to be a most unlikely candidate for rock ‘n’ roll in more ways than just his prior stylistic allegiance to jazz. Born in 1902 he was rapidly approaching fifty by the time his first rock-based session was cut, which doesn’t make him the oldest to make their rock debut to date, that would be Todd Rhodes, two years his senior, but like Rhodes it was a long and winding road past fading memories of jazz glory days that led to long stints as club acts before landing at the doorstep of rock ‘n’ roll in the late 1940’s hoping to revive their careers. Rhodes we know did do just that, scoring a few Top Ten hits and being a fixture in rock for years, on his own and backing others. He may never have become a genuine star, but he was able to keep drawing paychecks to put out records that sold well and guaranteed him enthusiastic audiences at live gigs for the rest of his career. Was such an outcome simply a fluke in Rhodes case, or was the move towards rock for survival a blueprint worth following for Edgar Hayes? 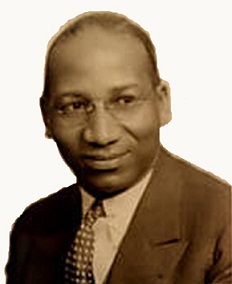 Having been playing professionally since 1922 after graduating college with a degree in music, Hayes gained notice for his piano work with Mills Blue Rhythm Band in the 1930’s before forming his own group in 1937, scoring with a version of Stardust and launching one of the most popular records of the next decade with the original version of In The Mood on the flip side of that monumental single. But when the war came his band dissolved and he was resigned to playing California clubs for years after that. The dual recording bans (1942-1944 and again in 1948) may have further hindered his chances at resuming the noteworthy career he seemed to be building for himself and by the time he finally regained his footing and drew interest from the Los Angeles based Exclusive Records the musical landscape had utterly transformed since his last studio shot a decade earlier. Most obvious of these changes was the fact that the hottest brand of music in black America was now rock ‘n’ roll. Though jazz was still vibrant enough commercially to offer a reasonable chance for success, for some reason Hayes ventured into a different realm. Maybe he was resentful over the lack of opportunities in jazz circles for someone of his caliber over the past few years, or maybe he’d merely picked up on the excitement coming from the newer sounds and wanted to explore it out of a sense of restless creativity. Hayes’s group, the somewhat country and western sounding Stardusters (though on the label for this first release they’re credited merely as “And Orchestra”, an even more inappropriate term considering the musical style), consisted of drummer Bryant Allen, bassist Curtis Counce and guitarist Teddy Bunn, all solid jazz musicians themselves. When they landed at Exclusive Records at the tail end of 1948 their focus was pretty far removed from what all of them had laid down on record in the increasingly distant past. What Hayes and company actually thought of the return to a more rudimentary musical approach is a mystery of course, but the effectiveness of the arrangement in this style is immediately evident. Fat Meat ‘N’ Greens fits comfortably into the groove side of the rock instrumental equation even though normally that is carried off with saxophones churning. Here there are no horns obviously and so the primary lifting is spread out between Hayes on piano and Bunn on guitar. Hayes takes the intro at a crawling pace that comes across as alluring more than simplistic, though it’s definitely that as well. There’s nothing difficult about it at all, it’s a pattern and tempo a nine year old with a year of lessons could credibly execute, but it works all the same in setting an anticipatory scene. WHAT it anticipates isn’t certain, there’s no giveaways with any rim shots from the drummer or howls of the band to create a party-like atmosphere, yet you sense a fair amount of tension building somehow. Maybe it’s your imagination working on you but it’s palpable all the same. But then Teddy Bunn’s guitar comes in and now the fuse is lit. He plays with bluesy tinge, largely because – to this point anyway – it had been blues which had used the guitar as a prime component of the music. But even so it doesn’t succumb to those aesthetics completely, walking the tightrope between styles, certainly keeping it in view of the jazz background they shared, yet maintaining the edginess that is aligning it most firmly with rock instrumentals. He too is playing rather basic stuff, yet within that framework he bends notes and shifts tones with a casual, almost lazy confidence that keeps you leaning forward, expecting something to happen perhaps, but not altogether relying on some dramatic payoff to maintain your interest or meet your expectations. It’s merely enough that they all are creating an illusion of something stirring under the surface. Dropping hints that this world you’ve moved into as night falls is alive in ways that aren’t apparent at a glance. 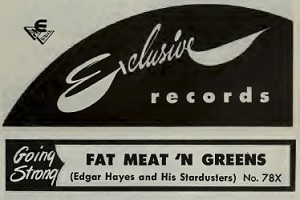 I think it’s easy to see Exclusive Records mind at work here too in marketing this with a form of name association, as the title Fat Meat ‘N’ Greens – coming as it does on the heels of a huge rock hit in Hal Singer’s Cornbread – is something designed to let rock listeners know this was meant for them. Though of course instrumentals can be called anything that comes to mind as being catchy, we’ve mostly seen them used for promotional purposes rather than choosing a title to conjure up an image that suits the specific music itself. That’s true here as well because this sounds like something far more shadowy than the backwoods roadhouse scene its title suggests. Granted the blues elements might get you to think otherwise but overall this has more of an urban night scene aura permeating the entire record, something that stands out even more when Hayes jumps back into the forefront with some enticing piano work. Throw this track in a black and white movie taking place at night on a waterfront just before some poor sap is about to get a blackjack to the skull and dumped in the bay for some sinister reason and it’d fit perfectly. It’s mood music for the other side of the tracks, which as we know all too well is where rock ‘n’ roll was born, raised and thrives. There’s a minimalist vibe to it all, each instrument careful not to step on one another, yet even the stand up bass gets a bit of a spotlight. The pace never quickens, the mood is never broken and the tension never gets resolved. Yet that’s what makes it work as well as it does. Fat Meat ‘N’ Greens creates an ambiance that, even if the picture your mind creates differs from the one mine came up with, remains effective throughout. On the surface there wasn’t much chance that this would connect with modern audiences. After all, Hayes himself was ten years past whatever name recognition he once had and this was aimed at a generation who hadn’t even been old enough to listen to his music back then. In addition he was stepping away from his comfort zone in jazz to tackle an entirely new musical setting which is never an easy transition to make. Even the sparse sound the record contained would get you to think it’d have trouble getting noticed, especially on a label without a powerful distribution and promotional machine. Shows what you know! As improbable as it is Edgar Hayes got a hit out of this, just missing the Top Ten nationally in Billboard while rising as high as #2 on multiple Cash Box regional charts including Harlem and Cleveland, something which must’ve eased some of the bitterness he and the other had to be tasting during their long absence from the recording scene. You’d think this would mark a career resurgence, like a similar jump to rock had done for Todd Rhodes, and at least re-establish Hayes and company as a band worth taking chances on, knowing they’d come up with something worthwhile no matter what type of music they decided to cut. Yet even with a second hit to come out of this session on the horizon Hayes would again have to wait another decade before recording again, by which time a third revival was completely out of the question. But as second acts go this still stands as a resounding success, modest in its aims perhaps but endearingly solid in its execution and as such it makes for one of the better feel-good stories we’ve encountered in rock ‘n’ roll to date. I’m really feeling the groove of this record, man. Hayes and Bunn, wherever they may or may not be, should be proud of what they waxed in 1948 (the solid rhythm section too). This one’s a firm “7” for me. Leave a reply on "Edgar Hayes & His Stardusters: “Fat Meat ‘N’ Greens”"